Ge2p or Ge3d typically used. Ge3d may be preferable if germanium is buried and at low concentration. Ge3d electrons have higher kinetic energy and therefore have a deeper sampling depth compared to the low kinetic energy Ge2p electrons. Ge2p region has significantly split spin-orbit components (Δ=31.1 eV, intensity ratio=0.478). 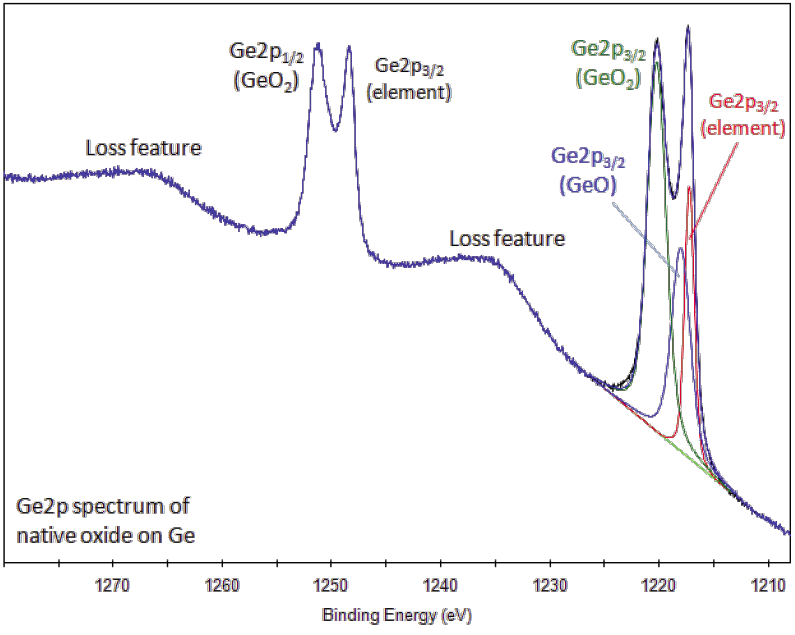 Ge2p peaks have symmetric lineshape for elemental germanium and its compounds. Typically only the Ge2p3/2 component of the Ge2p region is fitted and quantified. Loss feature may be observed between spin-orbit components ( 1235eV) and to higher binding energy of Ge2p1/2 component ( 1265ev). Ge3d peak has overlapping spin-orbit components (Δ=0.58 eV, intensity ratio=0.67). Splitting is observable for elemental germanium but may be ignored for germanium compounds. 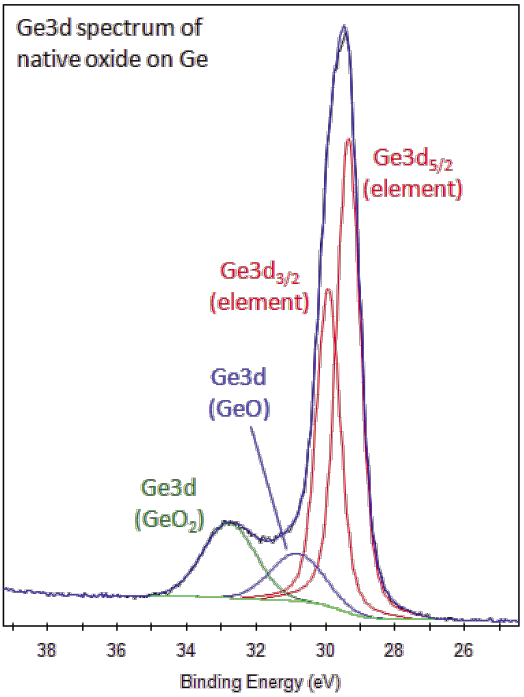 Ge3d peaks have symmetric lineshape for elemental germanium and its compounds. Ge LMM peaks (between 300eV-600eV) overlap with many XPS peaks from other elements. 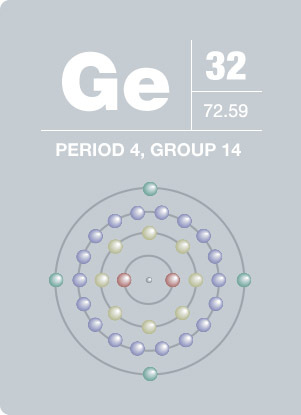 Chemically similar to tin, germanium is an important semiconductor material. Due to its small band gap, germanium is highly sensitive to infrared light and is used as a detector material in infrared and Raman spectrometers. Germanium’s refraction and dispersion properties make it useful in wide-angle camera lenses and in microscope objective lenses. Silicon germanide (SiGe) is becoming an important material in high speed integrated circuits. Germanium transistors are used in modern electric guitars to simulate the sound of Rock and Roll era amplifiers.